Posted on 24, April 2017 by EuropaWire PR Editors | This entry was posted in Healthcare, Pharma & Biotech, Switzerland and tagged American Academy of Neurology Annual Meeting, neuroscience, OCREVUS, Roche, Sandra Horning. Bookmark the permalink. BASEL, 24-Apr-2017 — /EuropaWire/ — Roche (SIX: RO, ROG; OTCQX: RHHBY) announced today that new data on OCREVUS™ (ocrelizumab) in people with relapsing forms of multiple sclerosis (RMS) and primary progressive MS (PPMS) will be presented during the 69th American Academy of Neurology (AAN) Annual Meeting from 22 to 28 April in Boston, Massachusetts. Data presented across three platform sessions will describe the rapid benefit of OCREVUS in RMS patients in the first eight weeks of treatment and its effect on fatigue in PPMS patients. 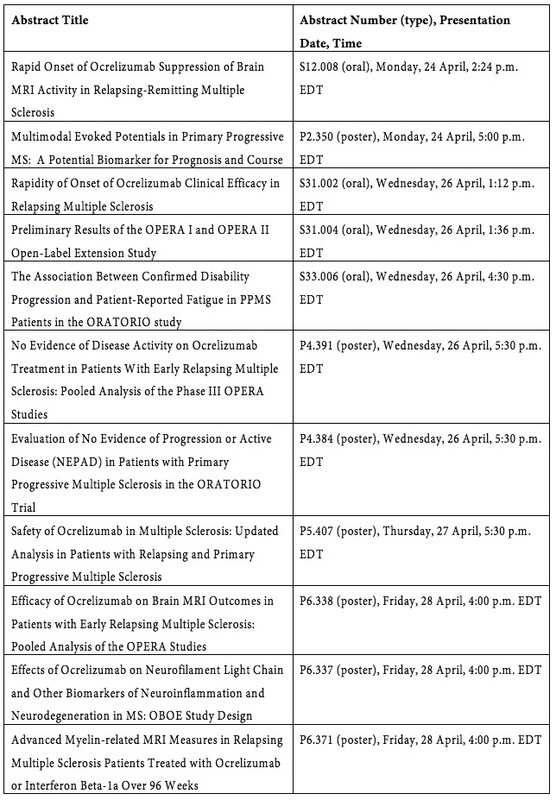 Efficacy and safety data from the open-label extension study will also be presented, as well as the effect of OCREVUS on active disease and progression in PPMS. OCREVUS received approval from the U.S. Food and Drug Administration (FDA) on 28 March 2017 for the treatment of adult patients with relapsing or primary progressive forms of MS. Follow Roche on Twitter via @Roche and keep up to date with AAN 2017 Annual Meeting news and updates by using the hashtag #AANAM. OCREVUS is a humanised monoclonal antibody designed to target CD20-positive B cells, a specific type of immune cell thought to be a key contributor to myelin (nerve cell insulation and support) and axonal (nerve cell) damage. This nerve cell damage can lead to disability in people with MS. Based on preclinical studies, OCREVUS binds to CD20 cell surface proteins expressed on certain B cells, but not on stem cells or plasma cells, and therefore important functions of the immune system may be preserved. OCREVUS is administered by intravenous infusion every six months. The initial dose is given as two 300 mg infusions given two weeks apart. Subsequent doses are given as single 600 mg infusions. Neuroscience is a major focus of research and development at Roche. The company’s goal is to develop treatment options based on the biology of the nervous system to help improve the lives of people with chronic and potentially devastating diseases. Roche has more than a dozen investigational medicines in clinical development for diseases that include multiple sclerosis, Alzheimer’s disease, spinal muscular atrophy, Parkinson’s disease and autism. Founded in 1896, Roche continues to search for better ways to prevent, diagnose and treat diseases and make a sustainable contribution to society. The company also aims for improving patient access to medical innovations by working with all relevant stakeholders. Twenty-nine medicines developed by Roche are included in the World Health Organization Model Lists of Essential Medicines, among them life-saving antibiotics, antimalarials and cancer medicines. Roche has been recognised as the Group Leader in sustainability within the Pharmaceuticals, Biotechnology & Life Sciences Industry eight years in a row by the Dow Jones Sustainability Indices (DJSI).